The public prosecutors office in the city of Arnhem has ordered hosting provider Leaseweb to take down a squatters’ site from Nijmegen. Hundreds of other squatters’ websites which also use the Squat.net servers hosted by Leaseweb also went off-line. Squatters’ website GroteBroek.nl aroused the ire of the authorities by putting up an image of Queen Beatrix with a noose around her neck. The image was intended as an invitation to a squatters’ party. However, the public prosecutors office regarded the image as lèse majesté and ordered Leaseweb to take down the offending website. Read more. PESHAWAR: A US drone strike killed four suspected terrorists in North Waziristan near the Afghan border on Sunday, intelligence officials and witnesses said, the first strike in almost a month. The remotely piloted aircraft targeted an abandoned girls' high school building used by terrorists in Miranshah, the main town in North Waziristan, the officials and witnesses said. Three terrorists were wounded. Read more. Portuguese MEP Ana Gomes was denied entry to Bahrain by the monarchy that is ruling this country. She was sent to observe the situation of the political prisoners. Gomes alleged that she had to wait to get a visa but it was denied "in spite of having a diplomatic passport". The government of Israel has approved the construction of another 50 houses in a settlement near Jerusalem to relocate Migron's settlers. Palestine is opposing to this decision. Newly-introduced farming techniques in Lebanon, based on maintaining the soil's natural capacity for self-recuperation, promise lower costs and higher yields as well as a positive environmental impact. Lebanese agriculture has suffered a severe decline and is in dire need of reinvigoration. Read more. 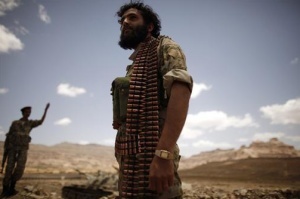 (Reuters) - Syrian rebels fighting to topple President Bashar al-Assad say they are shifting tactics towards homemade bombs, hoping to even the odds between their outgunned forces and his powerful army. A series of deadly blasts in the past week suggests they are getting better at it. Read more. Spain has plunged into a second recession amid government measures to rein in the country's debt. Ratings agency Standard and Poors has downgraded nine of Spain's banks, many of which are bogged down in bad loans. It also comes as Spain's unemployment rate has soared to almost 25 per cent, the highest in Europe. And sweeping cuts to health care and education have seen thousands taking to the streets, angered at the government austerity measures. RT gets some analysis on the situation in the country from Professor of economics Philipp Bagus, author of the book "The tragedy of the euro". America sees the’ looting’ of the US Treasury, and the money given to a Wall Street ‘criminal class’, journalist Chris Hedges told RT. He adds that ordinary people are caught in the vice of unregulated corporate capitalism – with no escape. Read more. On tonight’s broadcast James explores the question of freedom versus slavery. The signs of the police state control grid are everywhere, but does this mean we are already enslaved? If so, then what does it mean to be free? What if freedom was nothing more than a choice that we make each and every day to assert our cognitive independence? Find out more in tonight’s edition of Corbett Report Radio. Read more. Johan Galtung, Norwegian sociologist nicknamed the “father of peace studies,” made anti-Semitic and anti-Israeli remarks while lecturing at the University of Oslo, in an article published afterward in the Norwegian press and in an interview with Haaretz that followed. Read more. Hamas Political Bureau Chief Khaled Meshaal says the case of the ongoing mass hunger strike by Palestinians in Israeli jails will be referred to the UN. The alleged leader of the FARC's 38th Front has been killed during military operations which left at least three other rebels dead in northeastern Colombia, according to local media. 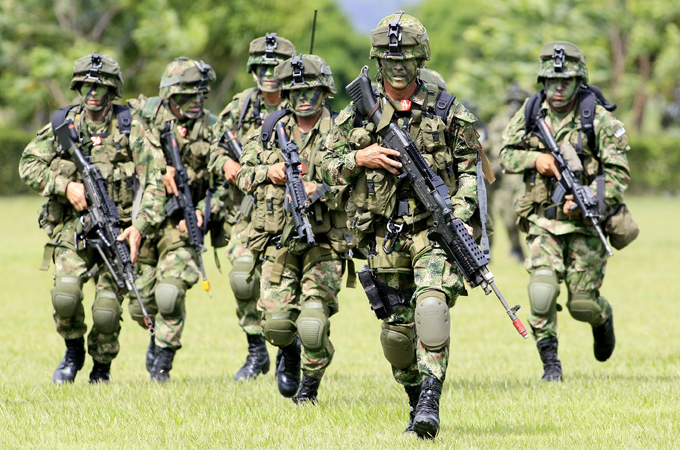 Efrain Mendez, alias "Guillermo Sanchez," was apparently killed during a joint exercise between the Colombian Army and Air Force in the municipality of Tame, Arauca Department. Read more. They do not have a group religion, their beliefs are diverse. They do not have a central leader, they govern themselves by a special form of democracy. They are self-supporting economically, and partly self-sufficient. They make and sell casual furniture, hammocks and tofu. They live in Twin Oaks. Standoffs between Beijing and regional neighbours sees closer co-operation between US and Philippines. China’s growing military power, and the increasing nuclear threat from North Korea, has seen the US turn more of its attention toward Asia. Read more. More than 20 cannabis farms and factories were discovered by police every day last year as they seized drugs which could sell for £100 million on the streets, figures showed today. Senior police chiefs said the size and scale of the farms were reducing as criminals producing cannabis were spreading the risk and minimising losses by employing a large number of so-called gardeners to manage small sites across multiple residential areas. Read more. The Somalian transitional government hopes new banknotes will be part of solution to the country’s price hikes, as hopes for a political settlement are rising. Mogadishu – The problems Somalia’s citizens must endure are not confined to the longstanding breakdown of security in their country. Their grievances extend to all aspects of their lives. Read more. Meshaal said in Cairo on Sunday that he had agreed on the issue with the acting Palestinian Authority chief, Mahmoud Abbas and the Arab League (AL) Secretary-General Nabil al-Arabi, reported English-language Lebanese newspaper The Daily Star. Read more. The green revolution is on in Russia. Gyroscopic cars, batteries that breathe and motors with their roots in space: the rush is on to find eco-friendly solutions in the auto industry. A new wave of clean car engineering in Russia gets kickstarted by the launch of Moscow's electric charging infrastructure. Iran is planning to hold the 6th International Digital Media Exhibition, presenting the latest digital achievements in the capital city of Tehran. The event aims to increase competition among digital media producers, promote the industry and support international and domestic markets, said director of Iran's Information Technology and Digital Media Development Center Hassan Alizadeh. Read more. Everyone is talking about the Mayan Prophecies of 2012. But who is listening to the Maya? This groundbreaking film brings us the voices of the Mayan people as they share their perspectives on the prophecies of their ancestors and their fight to defend Mother Earth and their culture from destruction. 2012 The Mayan Word is both a message of hope and a call to action. Featuring testimonies from contemporary Mayans throughout Mesoamerica, from spiritual guides to activists, community leaders, farmers, artists, teachers, and children, this film is an extraordinary journey into the heart of Mayan struggle and spirituality. British media look to be in no hurry to cover Russian MP Andrey Lugovoy’s British polygraph test, which showed he did not kill former security officer Aleksandr Litvinenko. It is odd that the media stay quiet, journalist Kenneth McTaggart told RT. ­The test was conducted by British experts on Wednesday, with the results immediately picked up by Russian media. In the UK, however, the news saw far less enthusiasm – with just a handful of small-scale titles covering it. Read more. In an interview with SPIEGEL ONLINE, boxer and pro-democracy activist Vitali Klitschko talks about the worsening situation in his country and the case of the jailed opposition leader Yulia Tymoshenko. While he rejects calls to boycott the upcoming European Football Championships, he says the event is a good opportunity to draw attention to the Ukraine government's failures. SPIEGEL ONLINE: Mr. Klitschko, eastern Ukraine has been shaken by bombing attacks. What's behind them? Read more. BETHLEHEM (Ma'an) -- The non-aligned movement of states will hold a ministerial meeting in May in the Egyptian resort city of Sharm el-Sheikh, Gulf media reported Friday. Some 120 member countries are expected to send delegations to the meeting, according to reports which cited a statement from the Egyptian foreign ministry in local newspapers. 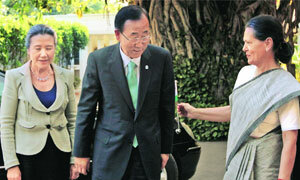 The meeting will focus on Syria, Iraq, Sudan and Palestine, the report said. Dakar, Apr 29 (Prensa Latina) A mini-summit on the respective crises coup in Mali and Guinea Bissau will be held in this capital on Thursday May 3, announced the Senegalese government. Dakar said that the meeting will be attended by representatives of the Contact Group countries (Nigeria, Gambia, Togo, Cape Verde, Guinea and Senegal) of the Economic Community of West African States (Ecowas). Read more. KUFRA, Libya, Apr 28, 2012 (IPS) - The recent outbreak of violence between the largely segregated Zwai and Tabu tribes in Libya’s remote, Saharan town of Kufra shattered the uneasy calm that held since last February’s clashes, resulting in more than 100 deaths. The clashes illustrate the challenges in building a new state. In the power vacuum following Muammar Gaddafi’s overthrow, the fighting over turf and rights at this lucrative smuggling hub - nearly 1,000 miles from Libya’s coast bordering Egypt, Sudan and Chad - threatens Kufra’s equitable participation in June’s national elections and the stability of Libya’s southeast region. Read more. Saddam Husain’s illegal use of chemical weapons. The 1st conference of the day of remembrance for all victims of chemical warfare has been held at Tehran’s Peace Museum, coinciding with the Persian Gulf Day. Iran’s head of the United Nations Information Center, UNIC, read a letter sent by Secretary General of the United Nations, Ban Ki Moon, in which he explained his pain for the victims and the families who suffered from the atrocities of chemical weapons usage. Read more. Iraqi authorities have called on the autonomous Kurdistan Region to hand over heavy weaponry it seized after the fall of former dictator Saddam Hussein. Sami al-Askari, who is a lawmaker and a close aide to Iraqi Prime Minister Nouri al-Maliki, said Saturday the Iraqi Constitution does not allow local governments to possess heavy weapons. Read more. China said Sunday it had rejected a proposal by the Philippines for international mediation to resolve their maritime dispute in the South China Sea. China "formally protested after a request for international mediation submitted by the Philippines over the sovereignty of the Scarborough Shoal," said a statement published on the foreign affairs ministry's website. Read more. As the violence in Syria continues unabated, neighbouring Lebanon has seized a shipment of smuggled weapons, destined for Syrian rebels. The sea-bound cache apparently came from Libya, which is backing the opponents of President Assad. Franklin Lamb, director of the NGO, Americans Concerned for Middle East Peace talks to RT. He thinks the latest arms smuggling effort was an attempt at regime change. At a conference in New York, Meir Dagan also voices support for former Shin Bet head Yuval Diskin, who criticized Israel's leadership handling of Iran crisis, Palestinian peace process. Former Mossad chief Meir Dagan said on Sunday that Iran's leadership is using "smart" diplomacy to advance its nuclear program, and that the Iranian threat is not a "quarrel" between Israel and Iran, but an international issue. Read more. The temperature's rising in Israel -- not just over a possible clash with Iran, but also over a threat of chemical weapons from Syria. Israelis are worried their country is unprepared for war, and doesn't even have enough gas masks and shelters. Dave Lindorff an Investigative Journalist & Founder of “This can't be happening” says reports about financial institutions communicating with police over upcoming Occupy Wall Street May 1st demonstrations is not a new story. In an interview with Press TV’s U.S. Desk, Lindorff said that before such recent revelations, during the Occupy Wall Street movement last fall, the former New York City Mayor Rudy Giuliani “had set up in conjunction with the large banks on Wall Street, a special police unit, that was actually private duty police who were normally on the pay-roll of the city, to work directly for the banks”. Read more. MADRID — Tens of thousands of people demonstrated across Spain on Sunday against new austerity measures targetting education and health care spending. "Cuts in health care and education, that's the last straw for us, the working class," said Domingo Zamora, a 60-year-old civil servant in Madrid. "Without that, what's left? We don't even have work." Read more. Thousands of US soldiers are going into battle fueled by all sorts of prescription medications, be they amphetamines, antidepressants, sedatives or others. Largely unmonitored consumption of drugs can lead to aberrant behavior and mental disorders. Over 110,000 American service personnel took prescribed medications in 2011 to battle through everyday military routine. Four people were killed and roughly 70 injured in Saturday's clashes outside the Egyptian Defence Ministry in Cairo's Abassiya district, Mohamed Fatouh, head of the Tahrir Doctors Association, told Al-Ahram's Arabic-language news website. Read more. Hundreds of indigenous people in Bolivia have kicked off a 580km march from the Amazon region to the seat of government in La Paz. The protest adds to a string of others confronting the president. Al Jazeera's Roger Wilkison reports. Foreign journalist among five missing after military and police patrol came under fire from FARC fighters, army says. Four security officials have been killed in fighting with the Colombian rebel group FARC in the country's south, the defence ministry says. Read more. Tripoli, Apr 29 (Prensa Latina) Militiamen have taken the control of the main airport of Benghazi to allegedly demand the self-proclaimed National Transitional Council sharing of power and social reinsertion. Military sources confirmed that the former insurgents remain deployed with different types of weapons at Benina airport, the second most important city in Libya, and considered the cradle of the uprising against Muamar El Gadafi last year. Read more. Mali coup leader Captain Amadou Sanago has rejected a decision by the Economic Community of West African States (ECOWAS) to send troops to the country. The West African bloc made the decision in Ivory Coast’s capital, Abidjan, on Thursday at an emergency summit dealing with the situation in Mali and nearby Guinea-Bissau. Read more. Activist Rockers "Outernational" Talk About Their New Political Album "We Are All Illegals"
As Supreme Court Debates SB-1070, Brooklyn-based activist punkers discuss new album, "Todos Somos Ilegales," and not boycotting Arizona. Earlier this year, the Brooklyn-based rock ensemble Outernational released Todos Somos Ilegales (We Are All Illegals) as a political treatise on US-Mexican border politics and how they harm individuals on both sides of the line. Read more. Sunday, April 29 marks the 20th anniversary of the start of the Los Angeles uprising and the two week anniversary of the resurrection of slain gangsta rapper Tupac Shakur as a hologram at Coachella. The events are not a coincidence. Rather, they are part of a cultural argument that speaks to racial tensions, police misconduct and vigilantism that have plagued the city for decades. Read more + video. Manila, Apr 28 (Prensa Latina) About 10 thousand soldiers from the Philippines and the United States concluded joint military exercises in five regions of the archipelago. According to the Philippine Army chief, Jessie Dellosa, such maneuvers evidence the commitment of both countries to achieve stability and security in the Asia Pacific region. Read more. A Wayuu indigenous leader accuses the Colombian government of genocide in a complaint filed with the United Nations (UN). "Many of the over 100 recognized indigenous peoples in Colombia are victims of genocide because of attacks by paramilitary groups that are fighting for territory, gasoline smuggling and drug trafficking in Venezuela," said Wayuu community leader Angelica Ortiz. Read more. Pakistani lawyer Shahzad Akbar, who represents families of civilians killed in U.S. drone strikes, was finally granted a visa to enter the U.S. this week after a long effort by the State Department to block his visit. He has just arrived in Washington, D.C., to attend the "Drone Summit: Killing and Spying by Remote Control," organized by human rights groups to call attention to the lethal rise in the number of drone strikes under the Obama administration. Read more. LONDON — Residents of a London apartment block have been told that surface-to-air missiles were likely to be installed on the building to help combat airborne terror threats to the Olympic Games. "A high-velocity missile system may be situated on the roof" and 10 soldiers stationed in the building for two months for the Games, which start on July 27, according to a leaflet distributed to residents. Read more. Yacimovich, Gal-On submit bills to dissolve Knesset; Mofaz prepares Kadima for early elections. Yisrael Beytenu chairman Avigdor Lieberman said on Saturday that his party was no longer obligated to the coalition, as heads of opposition parties called for early elections. Read more. Yuval Diskin said an attack might speed up any attempt by Iran to obtain a nuclear bomb. Read more. Mexico, Apr 28 (Prensa Latina) The strategy against drug trafficking and drug consumption in Mexico is a failure, so it is necessary to reformulate public policy to bring down a problem with huge magnitudes, an academician warned. Jose Narro, Rector of the National Autonomous University of Mexico (UNAM), said the government should change the mechanisms that are used today to combat drug consumption, production and distribution, because the ones currently implemented have not yielded the desired results. Read more. May's NATO summit in Chicago is still weeks away, but residents of the Windy City can expect to see armed federal agents patrolling the streets in preparation much sooner than that. Three weeks before international heads of state will converge in Chicago, Illinois for the annual NATO conference, the US Federal Protective Service will send armed officers into the city’s downtown district to prepare for the swarm of protesters expected to arrive in time for the event, slated for May 20 and 21. Read more. April 28 - Released newspaper editor tells home-coming crowd Morocco must stop jailing journalists. Deborah Lutterbeck reports. Physicists from the University of Zurich have discovered a previously unknown particle composed of three quarks in the Large Hadron Collider (LHC) particle accelerator. A new baryon could thus be detected for the first time at the LHC. The baryon known as Xi_b^* confirms fundamental assumptions of physics regarding the binding of quarks. Read more. Climate scientists at the Harvard School of Engineering and Applied Sciences (SEAS) have discovered that particulate pollution in the late 20th century created a “warming hole” over the eastern United States — that is, a cold patch where the effects of global warming were temporarily obscured. While greenhouse gases such as carbon dioxide and methane warm the Earth’s surface, tiny particles in the air can have the reverse effect on regional scales. Read more. ScienceDaily (Apr. 25, 2012) — There are lots of ways physicians might treat a patient after a heart attack -- certain resuscitation methods, aspirin, clot-busters and more. Now University of Colorado medical school researchers have found a new candidate: Intense light. "The study suggests that strong light, or even just daylight, might ease the risk of having a heart attack or suffering damage from one," says Tobias Eckle, MD, PhD, an associate professor of anesthesiology, cardiology, and cell and developmental biology at the University of Colorado School of Medicine. Read more. Unlike other demonstrations in the United States the Occupy Wall Street movement has survived and will continue to do so, an American activist tells Press TV. To further discuss the issue, Press TV has interviewed Caleb Maupin with the International Action Center in New York. What follows is an approximate transcription of the interview. Read more. Two people were severely injured, and dozens of protesters were treated for the effects of tear gas inhalation this week when Israeli troops attacked anti-wall and settlement protests on Friday in four West Bank communities. In the village of Nabi Saleh, in the central west Bank, one man and a journalist were injured when they got hit in the head by tear gas bombs. Read more. Ramallah, Apr 28 (Prensa Latina) The Israeli Navy opened fire today against Palestinian fishing boats in front of Gaza's coasts, reported sources of this city that also denounced the arrest of four children by Zionist soldiers. Palestinian media reported that Israeli warships were deployed this Saturday in the eastern Mediterranean Sea and opened fire with heavy artillery at fishing boats working in the area but did not injure any. Read more. A tense but calm atmosphere is prevailing in Tripoli where armed groups continue to patrol the streets as the citizens are trying to get back to their normal lives although, they admit, security is their main concern. The Lebanese navy has reportedly intercepted a ship loaded with three containers of weapons destined for Syrian opposition forces. The cargo vessel, which originated from Libya, was found on Saturday containing heavy machine guns, artillery shells, rockets, rocket launchers and other explosives, a security official said. Read more. Saudi Arabia recalled its ambassador to Egypt for “consultation” and temporarily closed its embassy and consulate in Cairo, Al Arabiya television reported. The Saudi Press Agency (SPA) reported that the reason behind the diplomatic move was “unjustified protests” in Egypt and attempts to storm the Saudi embassy and consulates which “threatened the safety of its employees.” Read more. They consider themselves descendants of an ancient tribe, in existence in the promised land for thousands of years. However, returning to home soil, they've been faced with government oppression and struggled to be properly recognized. RT's Paula Slier heard their story. United Nations, Apr 28 (Prensa Latina) The United Nations (UN) urged the eight countries that remain outside the Chemical Weapons Convention to adhere to this instrument and advance in the destruction of such artefacts. The call was made by the UN Secretary General, Ban Ki-moon in a message marking the Day of Remembrance for All Victims of Chemical Weapons, which anniversary is next Sunday. Read more. Police unleashed tear gas and chemical-laced water at thousands of protesters who staged one of Malaysia's largest street rallies in years on Saturday. The protesters were demanding fair rules for national elections expected soon. Authorities were seen detaining dozens of people, and officials said three protesters and 20 police officers were injured. At least 25-thousand people took to the streets of Malaysia's largest city, Kuala Lumpur, hoping to pressure Prime Minister Najib Razak's ruling coalition - which has held power for nearly 55 years - to overhaul electoral policies before polls that could be held as early as June. Muslim Brotherhood, the most powerful political force in Egypt, has said the government must resign over its failure to contain the energy crisis across the country. A debate is raging even among experts on the constitutionality of the move. Some believe the dissolution of parliament could cause further imbalances in the rocky transitional period in Egypt since the 2011 January revolution. But others have their strong reasons as to why it must happen. Read more. The House of Representative has passed CISPA, a bill seeking to increase the government's power to monitor private data online. Political commentator Luke Samuel says the law is directed against a nebulously-defined and imaginary threat. Luke Samuel, who writes for Spiked magazine, sat down with RT to talk about the reasons why there’s such a push for the bill to be adopted – and what it means for Internet users. Read more. Research into bird flu by the Erasmus Medical Centre in Rotterdam will be allowed to be published in the journal Science. Initially Deputy Agriculture Minister Henk Bleker had refused to allow publication of the scientific paper out of fears the knowledge could get into the hands of terrorists. The deputy minister says he has weighed the freedom of science against public safety issues. Read more. This segment from Noam Chomsky's ‪UCL Rickman Godlee Lecture 2011‬ is edited to increase the speed, remove pauses and compress the time. It's useful to recall how isolated the US and Europe are. The non-aligned counties, which is most of the world, they have for years been vigorously supporting Iran's right to enrich uranium. Within the region, as I mentioned, the irrelevant public even strongly favors Iranian nuclear weapons. The major regional power, Turkey, voted against the latest US sanctions motion in the Security Council, along with Brazil, which is the most admired country of the South as polls show. Read more + video. 'The Unfinished Revolution' presents the history of the Non Aligned Movement (NAM) that brought together a group of nations to work for world peace. Part 1 presents the people and circumstances that led to the creation of NAM. Drawing inspiration from non-violent movements led by leaders like Mohandas Karamchand Gandhi and Nelson Mandela, the NAM grew rapidly over a decade and was led by radical theorists and those insisting on a just world order. NAM also developed an economic wing and called for disarmament. Using archival footage, photographs, clips from fiction films and narration, the film presents a historical overview of the times that led to the emergence of NAM, its development and growth, its founding member, and the leadership provided by India. 'The Unfinished Revolution - Part 2' presents the disarray of NAM and its growing irrelevance despite holding the precise ideals that are necessary for world peace and development. The film discusses the relationship between countries of the Non Alignment Movement (NAM) and the United Nations, the challenges facing the NAM countries and how the leaders of these countries are trying to cope with these challenges. Since 1991, when the cold war ended, the future NAM has been questioned and a need to redefine its role, function and relevance has emerged. The film interviews a number of Indian and international leaders and analysts to find out what can possibly be the future of NAM. The 78-day-old Romanian government has collapsed after it lost a no-confidence vote over its adoption of stinging austerity measures. On Friday, 235 of the parliament’s 460 MPs voted against Prime Minister Mihai Razvan Ungureanu, four more than required by the Romanian Constitution to topple the government. Read more. The Roma, traditionally known as Gypsies around the world, have endured a life of exclusion and poverty. According to the UN Population Fund, UNFPA, ensuring access to sexual reproductive healthcare for Roma families is crucial in improving their living conditions. Helping women make informed choices as they start their families will empower them to gain greater control of their lives and futures. The violent uprising in Yemen which began more than a year ago has caused a massive increase in the price of food in the desert country. Many parents have been unable to feed their children properly, leaving them close to starvation. Al Jazeera's Jane Ferguson reports from Yemen's capital Sanaa. PHNOM PENH, April 27 (Xinhua) -- Cambodia on Friday launched a campaign to promote complementary feeding for children of 6-24 months, aiming at ensuring young children can receive adequate nutrition from the combination of baby food and breast milk. Speaking at the launch, Eng Huot, secretary of state at the Ministry of Health, said that based on a study in 2010, 40 percent of under five-year-olds had chronic malnutrition (stunted), 11 percent are acutely malnourished (wasted) and 28 percent are underweight. Read more. The United Nations Food and Agriculture Organization (FAO) has appealed to oil-exporting and mineral-rich countries to establish a fund to deal with a food crisis that has hit the Sahel region and other parts of Africa. "We're especially worried about the Sahel because there are already a lot of conflicts in that region, which risks seeing additional fighting if the famine spreads," FAO Director General Jose Graziano Da Silva said at a UN conference on Africa in Brazzaville, the capital of the Republic of Congo. Read more. US Assistant Secretary of State for Western Hemisphere Affairs Roberta Jacobson asked Argentina to go back to having a “positive” relationship with the international financial community and its creditors. US Assistant Secretary of State for Western Hemisphere Affairs Roberta Jacobson asked Argentina to go back to having a “positive” relationship with the international financial community and its creditors. Read more. South Sudanese President Salva Kiir has denied that his armed forces damaged the contested Heglig oilfield they seized for 10 days earlier this month because it belongs to South Sudan. "Panthou and the oil on top of it is ours ... it is impossible that we would damage or destroy (the facilities)," Kiir, using South Sudan's name for the Heglig oilfield, told tens of thousands of supporters on Friday after his return from China. Read more + video. KIEV, April 26 (Xinhua) -- Construction of a new shell over the damaged Chernobyl reactor began on Thursday, the 26th anniversary of the world's worst nuclear accident. "On behalf of Ukraine I express my gratitude to all donor countries the Chernobyl Fund 'Shelter' for their understanding and active support of our country to overcome the biggest disaster in human history," President Viktor Yanukovych said at a ceremony marking the start of construction. Read more. TOKYO — The operator of the crippled Fukushima nuclear plant on Friday offered the Japanese government a controlling stake in return for a huge cash injection that would prevent it going under. Tokyo Electric Power (TEPCO) submitted a 10-year restructuring plan to the government that will allow for the defacto nationalisation of the company in return for a 1 trillion yen payment, reports said. Read more. Iran’s ambassador to the International Atomic Energy Agency (IAEA) says the new round of multifaceted talks between Tehran and the IAEA will be held in Vienna on May 13 and 14. Ambassador Ali Asghar Soltanieh told reporters on Friday that the two sides would meet at the offices of Iran’s mission to the IAEA in the Austrian capital, IRNA reported. Read more. A secure communications channel set up to prevent misunderstandings that might lead to nuclear war is likely to expand to handling new kinds of conflict — in cyberspace. The Nuclear Risk Reduction Center, established in 1988 under President Ronald Reagan so that Washington and Moscow could alert each other to missile tests and space launches that could be mistaken as acts of aggression, would take a central role in an agreement nearing completion between U.S. and Russian negotiators. Read more. WASHINGTON, April 27 (Xinhua) -- The United States and Philippine defense and foreign affairs officials will discuss the alliance between the two nations Monday at the U.S. State Department, the American defense officials said Friday. Secretary of State Hillary Rodham Clinton and Defense Secretary Leon E. Panetta will meet with Philippine Foreign Affairs Secretary Albert Del Rosario and Secretary of National Defense Voltaire Gazmin. Read more. ISLAMABAD: Pakistan, Afghanistan and the United States said they would explore ways to arrange safe passage for Afghan Taliban militants who wish to engage in peace talks, officials from the three countries said on Friday. While not yet making an iron-clad guarantee, officials told a news conference in Islamabad they would form a group of experts to consider the proposal. Read more. United Nations Secretary General Ban Ki-moon on Friday asked India and Pakistan to continue with the peace dialogue, saying it is “significant” for both regional and global peace. He also called for bringing the perpetrators of the Mumbai terror attacks to justice. Ban also praised India’s “leadership role” at the UN Security Council and said New Delhi showed “great wisdom” and stuck to “principled positions” especially in the case of West Asian countries, during the Arab Spring. Read more. Egyptians hold new protests against the ruling military council, demanding the remnants of the former regime be banned from running for president, Press TV reports. Protesters took to the streets in the capital, Cairo, in a demonstration called "to protect the revolution." Read more. Jordanians have marched in the capital, Amman, to express their frustration with the appointment of Fayez Tarawneh as the country’s new prime minister. Thousands of Jordanians took to the streets on Friday, one day after King Abdullah II asked Tarawneh to form a new government, to protest against his appointment, stressing that the country’s premier must be elected by the people. Read more. GAZA CITY (Ma’an) -- Palestinian prisoners continued their hunger strike for the 11th consecutive day in protest of Israeli policy. A mass march went out in Gaza City, which was called by Hamas and Islamic Jihad to support the prisoners. Read more. The man who helped lead the so-called 'enhanced interrogation' programme in US prisons overseas has defended the policy. CIA operative Jose Rodriquez says in his new book that sleep deprivation and waterboarding techniques are justified. Al Jazeera's White House correspondent Patty Culhane reports. A suicide bomber has killed nine people and injured dozens in the Syrian capital, Damascus, according to state media. The developments on Friday came a day after Ban Ki-moon, the UN secretary-general, said the Syrian government was "in contravention" of an internationally agreed peace plan by keeping troops and heavy weapons in cities. Read more. Lebanon and Syria, the two sister states which share borders of around 330 kilometers of length, have been facing a great ordeal which begun with the beginning of unrest in Syria. Less than a week after news came out on weapons' smugglers infiltrating these borders , Lebanon Army Intelligence arrested one Syrian and two Lebanese nationals headed from Beirut towards the Syrian borders in a truck loaded with arms, ammunition and anti-armor shells. A tribe in the Brazilian Amazon rainforest is under threat from illegal loggers who are clearing the forest for timber and to make way for grazing land. The Charity, Survival International, is now launching a campaign to help protect these vulnerable indigenous people. There are only 455 people from the Awa-Guaja tribe left on earth. Around one hundred of them are what is known as un-contacted. The indigenous people are aware of the loggers and flee them. Still, the have made no contact with the outside world. The Awa-Guaja are some of the last remaining hunter-gatherer people left in the Amazon. Peasant farmer and agricultural organisations in Peru are demanding that the state set limits for concentrated land ownership. Why has Big Pharma failed to produce new antibiotics for deadly infections like MRSA (methicillin-resistant Staphylococcus aureus), VRE (vancomycin-resistant enterococci), C. Difficile and Acinetobacter baumannii even as they leap from hospital to community settings? Because there is no money in it. Read more. Americans, the British, and Western Europeans are accustomed to thinking of themselves as the representatives of freedom, democracy, and morality in the world. The West passes judgment on the rest of the world as if the West is God and the rest of the world are barbarians in need of chastisement, invasion, and occupation. Read more. Last year, the Occupy Movement rose up spontaneously in cities and towns across the country, radically shifted the discourse and rattled the economic elite with its defiant populism. It was, according to Noam Chomsky, “the first major public response to thirty years of class war.” Read more. More people are out of work in Spain now than at any time since records began. The new figures, announced on Friday, show that almost a quarter of the workforce are now unemployed. It comes just a day after ratings agency Standard and Poor's cut the country's credit rating two notches to Class B. with warnings that the country's economy could get worse. Al Jazeera's Sonia Gallego reports now from Madrid. The United States and Japan have announced a revised agreement on the US military presence on Okinawa that will shift thousands of US soldiers from the southern Japanese island to Guam and other Asia-Pacific sites. Thursday's plan, unveiled just days before Yoshihiko Noda, Japan's prime minister, visits US President Barack Obama, helps the allies work around the still unresolved dispute over moving the Futenma air base from a crowded part of Okinawa to a new site. Read more. On Friday, a court in The Hague ruled against 19 coffeeshop owners and other interested parties who are against the introduction of the compulsory ‘weed pass’. The pass will mean that ‘coffeeshops’ – outlets which are allowed to sell small amounts of cannabis to the public - will have to become private clubs, whose members have to be Dutch residents. Coffeeshops in the south of the Netherlands are going to have to introduce the weed pass on 1 May. Read more.